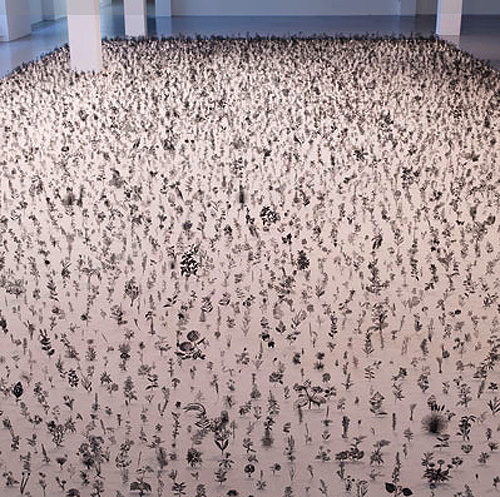 Israeli artist Zadok Ben David, who lives and works in London, created this interesting installation titled Blackfield. 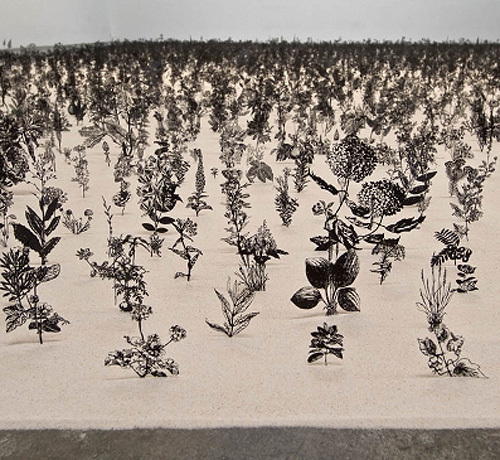 Made up of more than 12,000 small steel cut plant sculptures that spring out from a blanket of sand covering the gallery floor, there is a surprise element as one walks around the installation; what initially appears to be all black reveals itself as color on the other side. Each plant sculpture takes its form from Victorian botanical illustrations which Ben David finds in old text books. The detail on these is quite amazing. The miniature boxed version of the installation, in the next to last row of photos above, shows the two-sided quality of the plants in the mirrored wall. Here’s a video taken while circumambulating the installation. The effect is even better than I imagined. Photos courtesy of the artist; artnet; and lemOn’s flickr. This entry was posted in Art, Just Plain Cool, Stuff We Like. Bookmark the permalink. Absolutely wonderful!! What an idea! I was able to see it in this way. . . . .The meeting of a vain plant. It is a meeting of black “carbon”.The world without the color may mean death. The world without the color may mean unification. When it is unification, it is happy.Not death, it is an old world end by the unification.And it notices none of the daily life. When a person turned at the corner of the heart incidentally, the person notices. Hello! I’m writing a post about an exhibit that includes “Blackfield.” Would you be willing to grant permission for me to use the images of this piece that are included in this post? Hi Leda – They are not my images to grant permission, but I assume that if you give everyone the appropriate credit, including photographers and artist, it is most likely all right.